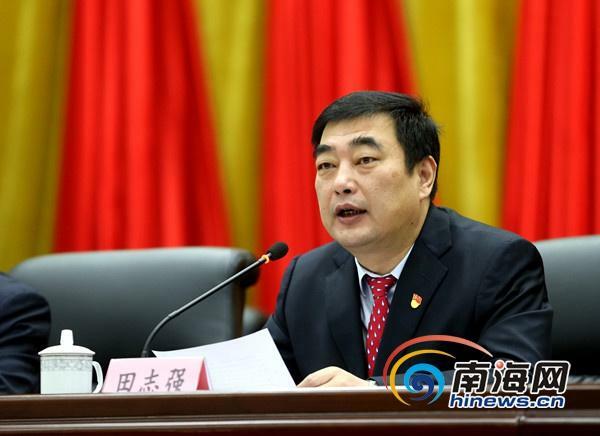 Tian Zhiqiang, deputy to the Hainan Provincial People’s Congress, secretary of the Tunchang County Committee, indicated Tunchang would cultivate twelve important industries, combining the regional characteristic and the base of industry, fostering potential and competitive big industries and high quality productions, developing the construction of “ecological circular agriculture demonstrate county and Nanyao health preservation tourist area”. Tunchang would also turn the Muse Lake tourist area into a healthy tourism, importing the tourism productions of medical healthy, supporting new farm to develop the productions. In terms of the position of the province and the direction of industry development, Tunchang would be guided by the idea of ecological civilization construction, developing the construction of Pilot Free Trade Zone and Free Trade Port. Firstly, Tunchang would focuse on developing the characteristic industry,developing “the three pillar industries” in terms of the processing of characteristic agriculture products, researching of south pharmacology, traditional Chinese medicine healthy tourism. We would regard the development of medical healthy industry as the most important thing in the tourism development. Secondly, Tunchang would implement the strategy of rural revitalization, improving the environment of urban and rural areas. Tunchang would also continue to develop the six major special regulation of ecological environment, improving the infrastructure and sanitary environment of urban and rural area. Thirdly, we would improve the people's livelihood, focusing on helping the poverty, supporting to the medical education. We would also corporate with famous schools in order to improve the level of running the school; developing the standardized construction of basic medical sanitary institution, improving the business environment, developing the social management and the leader’s capacities and promoting the economic development with high quality.